Enkay Engineering is one of the oldest and most experienced Environmental Contractors in Southern California that specialize in mold, lead and asbestos abatement and remediation. We are committed to protecting the environment and the health of our customers. Most of our business comes from referrals from our thousands of satisfied customers, because our excellent qualifications mean that we get the job done thoroughly, safely, within budget and on time, every time. See below for information about our years of experience, full licensing and prestigious certifications. Enkay Engineering has been serving the communities of Los Angeles County, Orange County, San Bernardino County and Riverside County since our founding in 1986. We are one of the oldest operating Environmental Contractors in Southern California, and our many years of business and thousands of satisfied customers are a testament to our consistently professional expertise and repeatedly successful jobs. We have a quarter of a century's experience doing residential, commercial and government jobs. We have removed asbestos air ducts from hundreds of private residences, asbestos floor tiles from Post Offices, and asbestos acoustic ceilings from commercial buildings. We have helped with the modernization of many schools in Orange County and Los Angeles County. In high rises, we have stripped insulation and fireproofing containing asbestos from pipes and beams. We have removed mold from apartment buildings and transite siding from factories. We have abated lead paint risks in housing units. In major remodeling projects, we've removed drywall and windows containing asbestos. Enkay Engineering has been in business for twenty-five years for a reason. We are Southern California's established leader in lead, asbestos and mold abatement and remediation. You can rely on our years of professional experience, backed by our excellent qualifications. 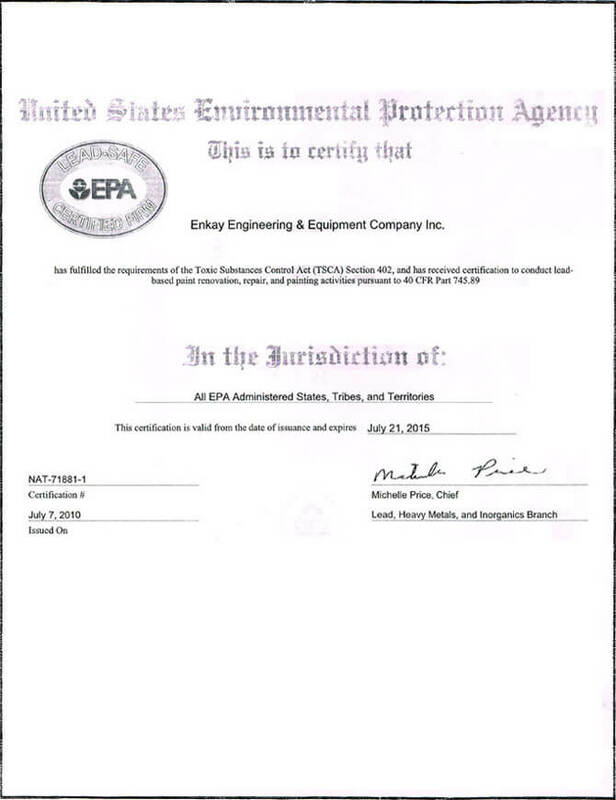 Enkay Engineering is a fully licensed, bonded and insured Environmental Contractor. We are fully compliant with, and in most cases exceed, standards set by NIOSH, SCAQMD, EPA and OSHA. Enkay Engineering is certified by the California Department of Industrial Relations' division of Occupational Safety and Health. We are also EPA LEAD certified. In addition, all of our professional technicians are AHERA certified to work in public buildings. Our Department of Occupational Safety and Health certification number is 54, which means that Enkay Engineering was the 54th Environmental Contractor in the entire state of California to receive this certification. Of the 53 businesses that received this certification before us, only five others are still in business today. 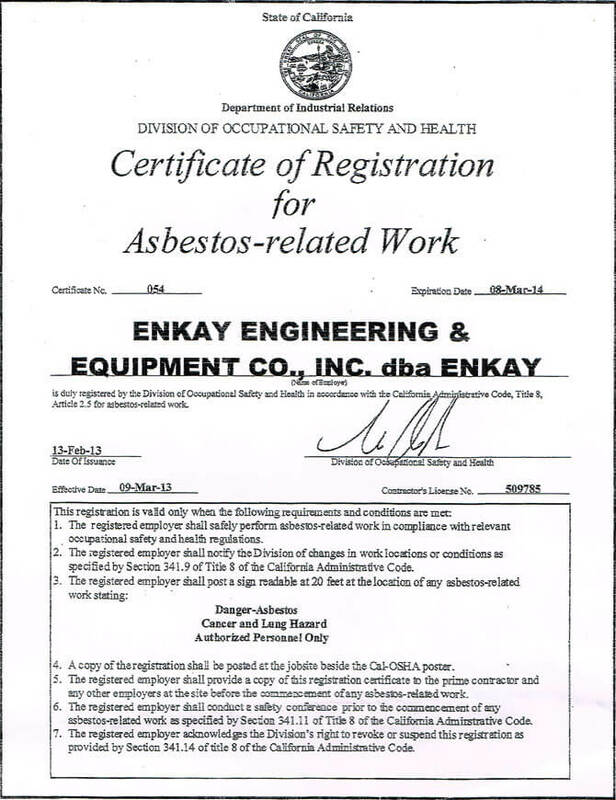 Enkay Engineering is currently the sixth oldest Asbestos Contractor in the state. Our certifications, licenses and years of experience make us the most highly qualified Environmental Contractor in Southern California. Enkay Engineering is your best choice for asbestos, lead and mold abatement and remediation services.